Happy Halloween! Gelish was kind enough to send me these two polishes with instructions for an easy Spooky Eye nail art. Look, it worked and it isn't the worst ever! You can find Gelish at your local Sally Beauty Supply or www.sallybeauty.com for $14.95. Dovima is a matte black with silver shimmer. The shimmer really shakes things up, and even people who aren't fans of black polish might want to give this a try. Loredana is my favorite of the collection. This is a charcoal grey with tons of silver shimmer. I actually already owned Posh and it was always a favorite of mine, despite being a shimmery red. You may not want to see my old swatches of Posh because my picture taking skills and polish application were a bit...weak. Yes, that's a nice way of saying it. You can purchase these now for $9, and they also have a brand new matte topcoat that you can make any polish matte for $10. They also have a sale going on right now where you can get 3 polishes for $15. You can find more information here. Stay up-to-date with all things Zoya (often including giveaways and sales!) on Twitter or Facebook. You know it's been a long week when it's Wednesday and you almost type that it is Monday! Ha! Just as another reprieve between fall and Halloween polishes is Green on the Runway from the OPI Coca-Cola Collection. When I first heard of this collaboration, I was all, "What what what??!" but I must admit that I liked a lot of the colors. Green on the Runway is a green and brown duochrome that is absolutely gorgeous. I got tons of compliments on it because the shift is really strong. It's supposed to be for Sprite, but I don't really see it that much. I guess they didn't want to do a white or a white glitter which is great because this one is awesome. I'm more of a Diet Coke girl, but the silver foil didn't pique my interest much. Anyway, Green on the Runway had a good formula and only needed 2 coats (even on my long talons...which aren't as long anymore). Cauldron Couture is a black and green glitter topper with green shreds and black large and small hexagonal glitter. There weren't too many shreds, and I really liked the mix of colors. These were pretty densely packed, but I still used 2 coats for all but Pumpkin Spice. The formula was perfect; not too thin and not too thick. I'll be honest: I'm not really into glow in the dark polishes. They usually don't work well, and if they do, it is the worst trying to take a picture of it. As you can see, with 2 coats over black, it leaves a milky shimmer in the light. I sat my fingers and bottle in light for over 5 minutes, and the bottle was crazy bright as you can see above. Unfortunately this overtook any color you could see well on my nails, but it was there. The formula and application was exceptional though. Unlike Cauldron Couture, Mystery Moonshine only contained multi-colored shreds of blue, green and orange. I really liked this one more than I thought I would. I like the color combination, and the removal process was extremely easy compared to the ones with glitter. At first I thought Pumpkin Spice was going to be a full coverage glitter, but I don't think you could make it opaque on its own (maybe with 4 coats). The mix of orange and gold reminds me of fall and Thanksgiving instead of Halloween, but nevermind that. Overall, this isn't a favorite from the collection, but it's still a nice glitter topper. SinfulColors Splatter Spell (2 coats) over 3 coats China Glaze Orange You Hot? And lastly we have Splatter Spell which is a topper with orange shreds and the same black glitter from Splatter Spell. I thought China Glaze's Orange You Hot? would be a good base, but it sort of makes the shreds blend in. Sorry about that! I should have picked a different orange or different color altogether. It applied exactly the same as Cauldron Couture which is a good thing. Overall, there are 14 Halloween colors you can find exclusively at Walgreens and Target. Some of these are repromotes, but you may not have them already. These retail for $1.99 each, which is a great deal. 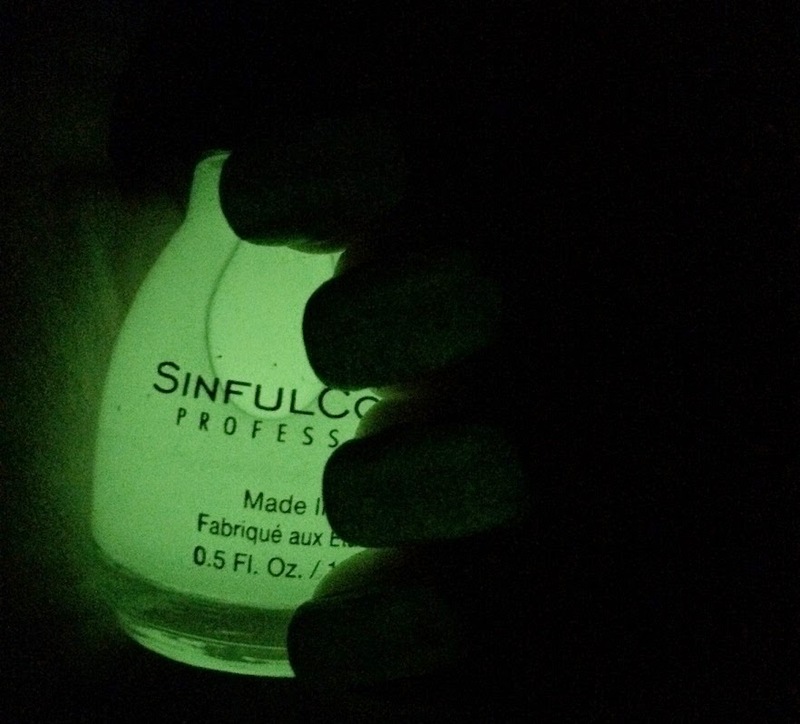 You can find SinfulColors on Twitter or Facebook to check out what's new in their world. As I've said before, I don't know the fate of the SinfulShine gel polishes, but I found a final (?) display at my local Rite Aid that hadn't been touched. I was out of the loop on SinfulColors polishes, so I didn't see the beauty that is Prosecco until in person. It's a taupe with grey and tons of gold shimmer and small flakes. This is the perfect work appropriate color that also has a little pizzazz (yeah, I just learned how to spell pizzazz). The formula was a bit thin and needed 3 full coats for full coverage, but I don't hold that against it. These retail for $1.99, but you can often get them on sale at your local drugstore. Morgan Taylor has a 2 color polish collection for Halloween which are appropriately orange and black. Little Black Dress is an amazing plain black creme that is completely opaque in 1 coat! Wet 'N Wild Black is cheap, but it doesn't always cover in 1 coat. Also, this doesn't have topcoat, so it is extremely shiny. The second color called Orange Crush is a bright neon orange. Since my nails are a bit long, I needed 3 coats, but if you have short nails, 2 coats may do it. It dries semi-matte, but I liked it better shiny with topcoat. The third item is not shown, but it is a topcoat called Make It Last, and although it doesn't say it's a quick dry topcoat, it dries pretty fast! I was actually really impressed. It smells like China Glaze's Fast Forward topcoat, too; it is a little sweet and weird. Overall, these are some great staples for a Halloween manicure. This trio will only set you back $19.90 right now. I'm happy to report that you can now buy individual Morgan Taylor polishes online without a license from Loxa Beauty for $8.50 each. You can keep up with Morgan Taylor on their Facebook and Twitter pages as well. Today is the last of the Me Couture Collection. I have a few Halloween polishes to show before getting to some of the Zoya polishes. As always, stay tuned for more Fall collections as well. Moda Bleu is a deep navy crelly that is extremely shiny (this is showing no topcoat). The application was smooth and only needed 2 heavy coats for full coverage, or 3 thin coats. I'm loving these dark blues this fall! The final polish is a deep, dusty mauve with gold shimmer that isn't really visible called Vintage Gown. I dunno, I think the name really fits the polish. It's a nice office appropriate color. As always, the formula and application was wonderful. Overall, I was really happy with the collection. If I had to choose my favorites, they would be Boho Chic, Moda Bleu and Vintage Gown. Barielle polishes can be found on their website or e-tailers like Transdesign. They often have sales or free shipping, so keep an eye on their Facebook page or Twitter. For example, just a few weeks ago they were offering a 20% off sale with free shipping! Oh Monday. That's all I have to say is, oh Monday. Continuing with the Barielle Me Couture Collection is Soho at Night which is a medium grape purple creme. The formula was a bit watery and sheer, as you can see from the few bald spots...overall, it pretty much covered in 2 coats. The second color is Taupe Notch which, of course, is a taupe creme. I always love colors like these, and this is no exception. This had the perfect application and formula I expect from Barielle. Barielle polishes can be found on their website or e-tailers like Transdesign. They often have sales or free shipping, so keep an eye on their Facebook page or Twitter. For example, just a few weeks ago they were offering a 20% off sale with free shipping!